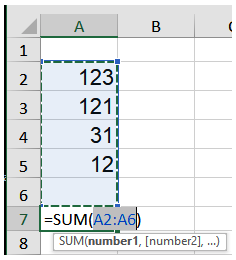 Autosum is a very handy tool in Excel to sum cells very fast. Autosum adds up a range of numbers automatically and places the result in a nearby cell. To perform Autosum, click a nearby cell and click Autosum on the Home tab and press Enter. 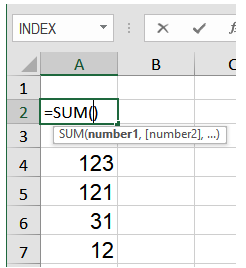 In this tutorial, you will learn how to use autosum in Excel. You can use the autosum feature from two locations in the ribbon. 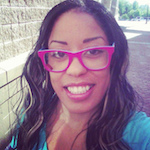 Click on cell B8 with your mouse. Click on Home > (Editing) Autosum. You can also press Alt + = (Windows) or Option + Cmd (Mac). 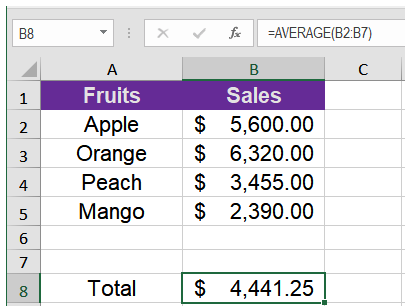 Excel will automatically select the cells B2:B5 and put it in a SUM function. Press Enter. 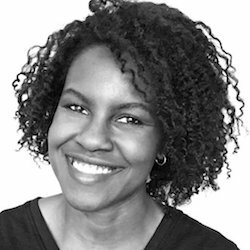 Cell B8 will now have the sum of B2:B5. Keep in mind when you click Autosum, Excel will include the empty cells B6 and B7 in the selection. This can be handy if you decide to add more rows in the future. To stop having the empty cells in the selection, select cell B2:B5 before clicking Autosum. Go to Home > (Advanced) Autosum. 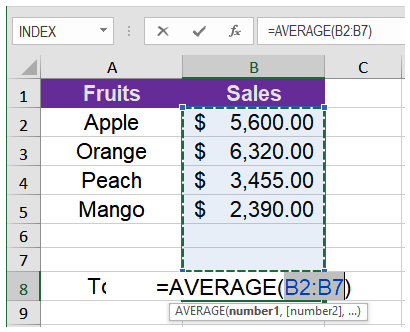 Excel will automatically generate the formulas for columns B to D and enter the results. Select cells F2:F4 by clicking on F2 and dragging it all the way to F4. Click Home > Advanced (Autosum). Click Enter. Cells F2:F4 will have the sums for each month. Select cells B2:F8. Click on B2 and drag it all the way to F8 with your mouse. Click the Autosum button from the advanced group in Home. This will put the column totals in the last row of the selection, and the row totals in the last column of the selection. It will also put a grand total in the bottom-right corner of the selection. AVERAGE – to return the average (arithmetic mean) of numbers. 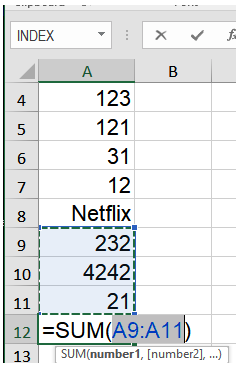 COUNT – to count cells with numbers. MAX – to get the largest value. MIN – to get the smallest value. To insert functions, other than SUM, you need to select a cell where you want to insert a formula, click the drop-down near AutoSum, and choose the function you desire from the list. Go to Home > (Advanced) Autosum and click on the drop down. 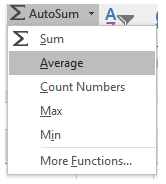 Select the Average function. 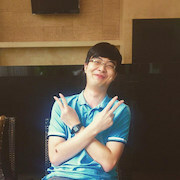 This will automatically add B2:B7 in the Average formula. This will show the average for each month. Selecting More Functions from the AutoSum drop down list, Excel will open the Insert Function dialog box. This is the same dialog box that open when you click Insert Function button from the Formulas tab or the fx button from the formula bar. Autosum follows a simple predefined algorithm to decide which cells to include in the selection. But it often runs into problems. The main reason behind Excel Autosum not working is using it without knowing how it works. If you have a value that is not a number in your range, Autosum will stop when it reaches that value. An exception to this, autosum will not work if the non-numeric value is an error. The formula used by Autosum will work, but the error will stop it calculating the result. On the GiftBaskets worksheet, in cell F9, use AutoSum to calculate the total items in basket 1. AutoFill the function down to cell F11. Is there a way to add up the x's? Basically autosum but for non-numbers. 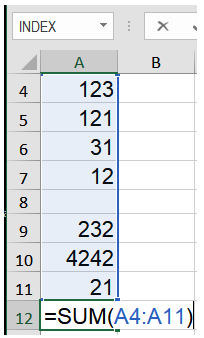 I HAVE ENTERED A CORRECT SUDOKU SOLUTION INTO EXCEL BUT THE AUTOSUM RESULTS FOR ROWS/COLUMNS ARE NOT ALL 45. IF I OVERTYPE THE SAME FIGURES I THEN GET THE 45 EXPECTED. 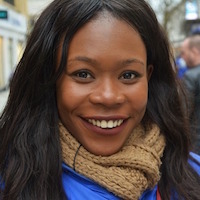 WHY DOES AUTOSUM SOMETIMES GIVE INCORECT RESULTS? 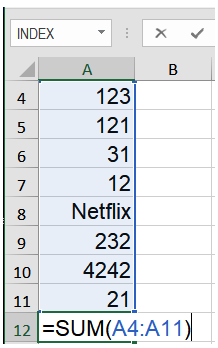 I need to know how I can autosum only numbers contained in a shaded, or conditionally formatted, cell?